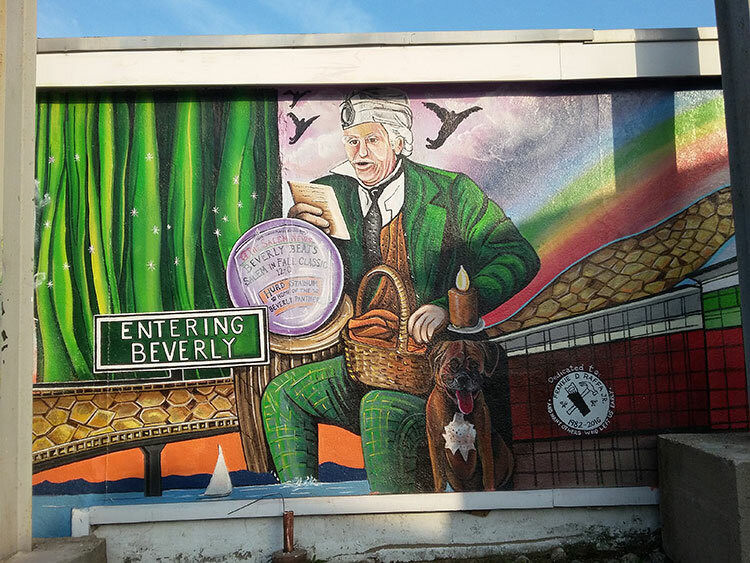 Beverly Arts District – BAD for short, was started in 2014 by Beverly Main Streets and their partners (Monserrat College of Art and the City of Beverly are the two main partners). Moreover many volunteers and local businesses contribute to its success. Presently these include Beverly, Hospital, Sterling Insurance Agency, and Endicott College, just to name a few. Beverly Main Streets was started by downtown business owners in 2002. These business owners noticed a shift away from people frequenting downtown stores and restaurants. They realized customers were going to the big malls instead. In light of that these merchants formed Beverly Main Streets and the goal of the organization was to strengthen and revitalize the downtown area. The main focus was to promote economic vitality, local businesses, organization and design. Additionally the city’s unique historical, cultural and educational resources come into play and are part of the push for local businesses. Within the Beverly Arts District is much of the Theater District. The Beverly Theater District is home to 4 amazing theaters. Downtown there is The Larcom, The Cabot, and 9 Wallis, which are all in the Arts District. Outside of the downtown area, just off of Route 128 is the North Shore Music Theater. 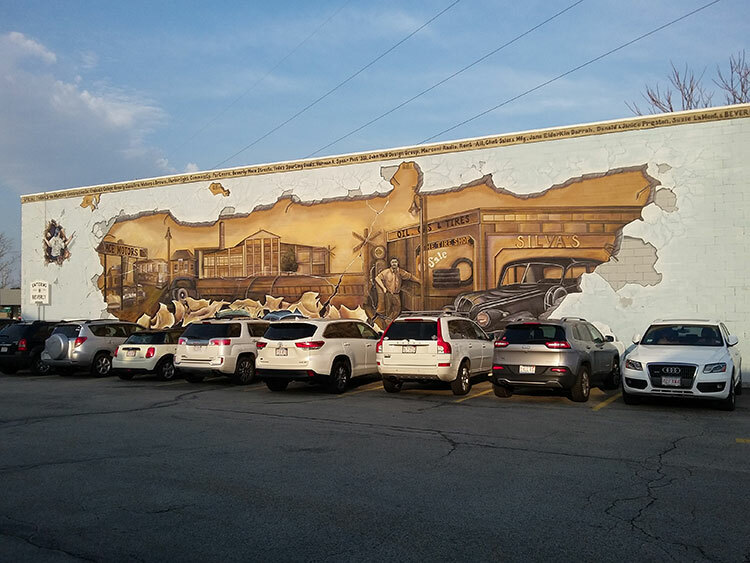 There are many incredible murals in the Beverly Arts District. 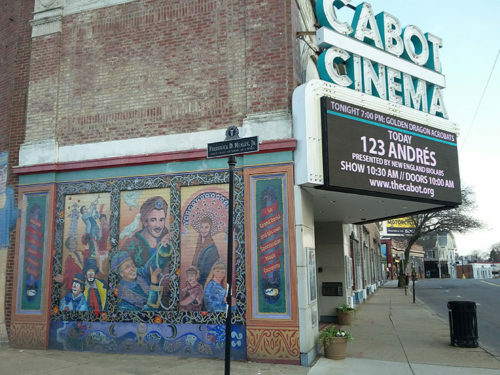 One such is on the left side of The Cabot Theater. It shows imagery from Le Grand David and His Own Spectacular Magic Company, which performed at the theater for about 36 years, up until about 2011. Colorful mural on the side of the building that once was home to the Casa de Moda, Judson Street, Beverly MA. Another great mural is on the Judson Street side of the building that was the former home of the Casa de Moda shop. It features a hometown scene that depicts a new imaginary side street going in behind the building. 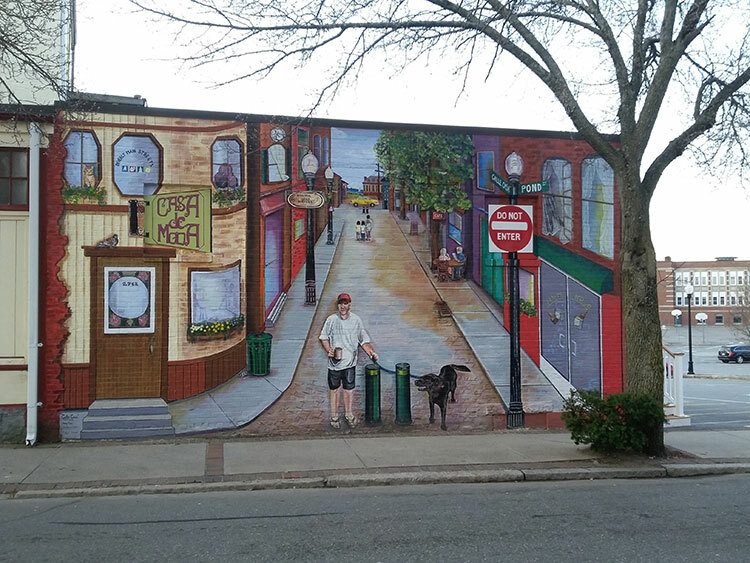 This idealistic summer scene shows a man with his Labrador Retriever looking out at Judson street. Behind him are people enjoying sitting outside at a sidewalk cafe while others appreciate a leisurely walk. The Organic Cafe, in Beverly, MA has a bright colorful mural gracing the parking lot side of the building which is in the Beverly Arts District. 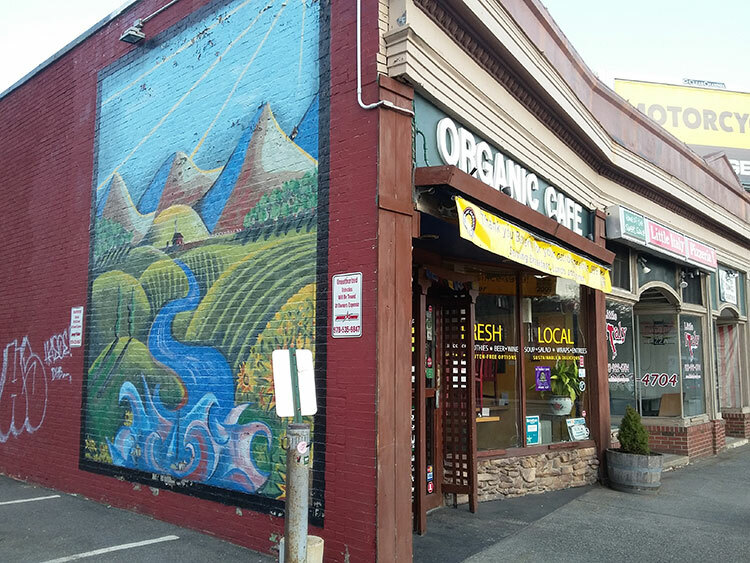 Beverly’s Organic Cafe has a splendid mural representing nature’s abundance. Which is embodied in mountains, fields, sunflowers and a gushing river. Spectacular mural on the side a building located at the intersection of Cabot and Rantoul Streets, in Beverly, MA. Additionally north on Cabot Street there are more murals. At the intersection of Cabot and Rantoul it’s hard to miss the building on the right. Notably the exterior of Beverly Gas and Tire appears to be crumbling away to reveal some of Beverly’s past. Specifically the old United Shoe Machinery building and a number of classic cars. 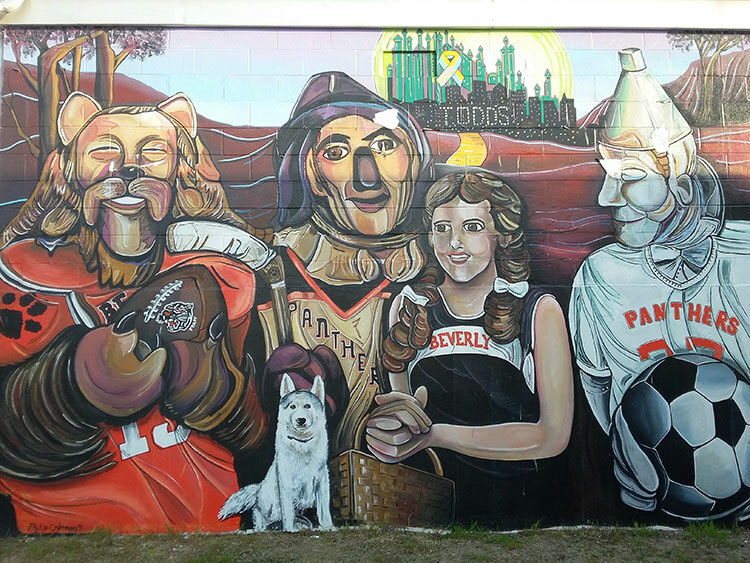 Todd’s Sporting Goods, in Beverly MA – a mural on the outside of the building featuring Dorothy, Cowardly Lion, Tin Woodman and Toto. I highly recommend continuing a little further up the road just over the railroad tracks. Underneath the billboards on the right. On the outside of Todd’s Sporting Goods is a series of murals which are based on The Wizard of Oz. Not to mention these are masterfully rendered. Moreover they have been given a the personal touch – many references to Beverly High School and students have been worked into the compositions. 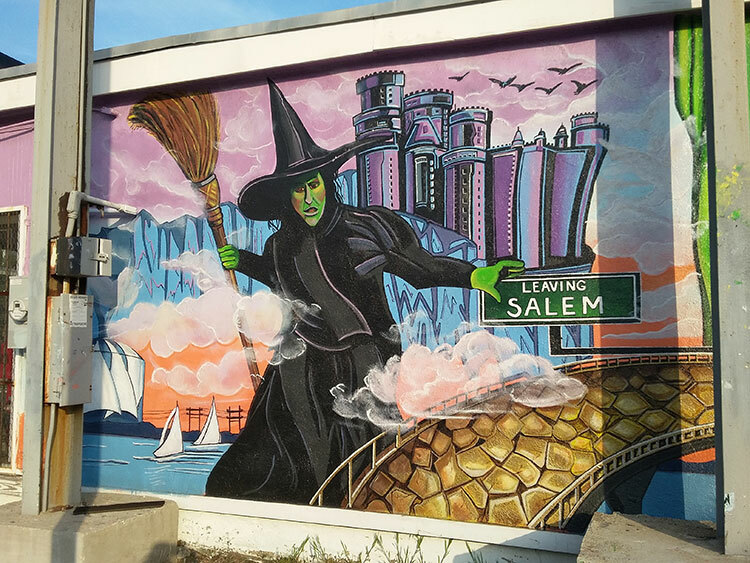 Todd’s Sporting Goods, in Beverly MA has a Wizard of Oz series of murals on the outside of the building. Here we see the Wicked Witch of the West leaving Salem and heading for Beverly! This mural on the outside of Todd’s Sporting Goods, in Beverly MA, features the Wizard of Oz. For more blog posts visit the Blog Archive page for a complete listing.